Fearless Leader sings theme song! Full Series Finally available on DVD! Did rural people like this show? Was the Pilot episode originally in black & white? What is the surreal stuff people mention? 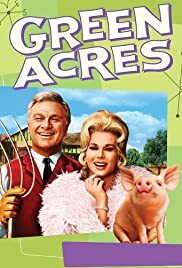 Is Green Acres a figment of Oliver's mental breakdown. Who's the CBS guy at the end of The Rutabaga Story?